As an unapologetic fan of all things that go bump in the night (and some in broad daylight too), serial killers have long held a morbid fascination for me. Who are these monsters in human skin, unafraid to venture and explore the murkiest of mankind’s impulses? Where do they come from, these purveyors of misery and pain, relishing in inflicting the worst kind of violence upon others? And most important of all, what does it say about us, and our culture, which is obsessed with their portrayal across various media? From Norman Bates to Hannibal to Dexter to Red John, pop culture has never had a shortage of these fictional symbols of inhuman psychology, presenting an evil so outrageous and incomprehensible to most us, that we find it hard to look away. And this, despite the blood, gore and misery that inevitably comes with this baggage. Adding to an ever-growing pile of culture reflecting on those who are more than just your garden-variety maniacs, is Joshua Williamson and Mike Henderson’s Nailbiter. And unlike a regular movie or a TV series focused on portraying a cat-and-mouse game between the perpetrator and an investigator, the premise of this comic series is an entirely different beast. Questioning society’s fascination with serial killers, it centers itself on a town- Buckaroo, Oregon, to be specific, which has given birth to more than 16 of the most dangerous serial killers in the world. As an FBI profiler who had become fanatically preoccupied with unearthing the mystery of this freakish place goes missing, an NSA agent, Finch, is then forced to find him and work by joining ranks with the town sheriff, Crane, and the latest human monster to come out of Buckaroo. And this criminal is no mere slice-and-dice kill machine either- he is Edward “Nailbiter” Warren, who, as you may have guessed, has a particular fetish for people who bite their nails, and chews upon said nails after stabbing them, right down to the bone. Scrumptious. I confess that I had very few expectation plunging into the series. There is a certain fatigue that has crept into the horror genre for well over a decade now, and when it comes to serial killers, it’s an even more pronounced dilemma. There is way too much idolization of those who are essentially evil distilled to its purest form, even as Bryan Fuller’s marvellous television series Hannibal, portrayed eponymously by Mads Mikkelsen, elevated the genre to an almost high art level. Nailbiter, however, has no such pretensions- it does not gloss over the pain inflicted upon victims, nor does it shy away from the hard questions of what birthed 16 of these sinister curiosities in one small town. Mesmerized by the amazing cover of the first issue portraying Warren chomping down on his own fingers, this was a series that reminded me of the possibilities that could be unearthed with a tired genre when secured within the hands of a master talent like Williamson. The premise of one town becoming the epicentre of so many serial killers allows the writers to set up the big questions of nature-versus-nurture which gives meat to the series. Drawn out across 20 issues till date, it seeks to not just explore what makes the Buckaroo gang what they are, but who they are. Granted, most of the serial killers have an almost gimmicky modus operandi which lends them an outlandish aura, but oh, what an aura! From the Terrible Two who only killed other twins, to the Book Burner who burned down libraries with people inside, to the Blonde who tortured the men who hit on her, or even the Silent Movie Killer who killed people who talked during movies – each of the serial killers makes you want to know them more and what made them the way they are. And being the consummate masters of the art of building tension, Williamson and Henderson have done a great job of fleshing out these queries slowly and intriguingly, even as they build on parallel arcs of elaborate government conspiracies, rogue federal agents, creepy religious men, rebellious emo teens, serial killer fans, and the whole she-bang that comes with living day in and day out in a tiny town which has been the epicentre of such a devastating human-made calamity as a small platoon of serial killers. Grabbing you from the get go with its disturbing visuals and snappy dialogue rendered in clean, bold lines and liberal dashes of colour (with red, for obvious reasons, dominating the palette- but the comic is not as gory as the covers lead you to believe), there is an engaging tonality to the whole series that makes you crave for more. The chemistry between the lead characters, Finch and Crane, makes you root for them in ways in which it has become hard to do so for the good guys, even as you are hopelessly charmed by the Nailbiter himself. Speaking of whom, he is a character who typifies the legend of most serial killers as attractive, charismatic boys next door with just a little not-quite-right in the head. But he’s no Hannibal Lecter either- there is a complexity to him which is driven by the author’s deliberately shrouding of his past, even as his present actions make you suspect if he ever was a serial killer to begin with. 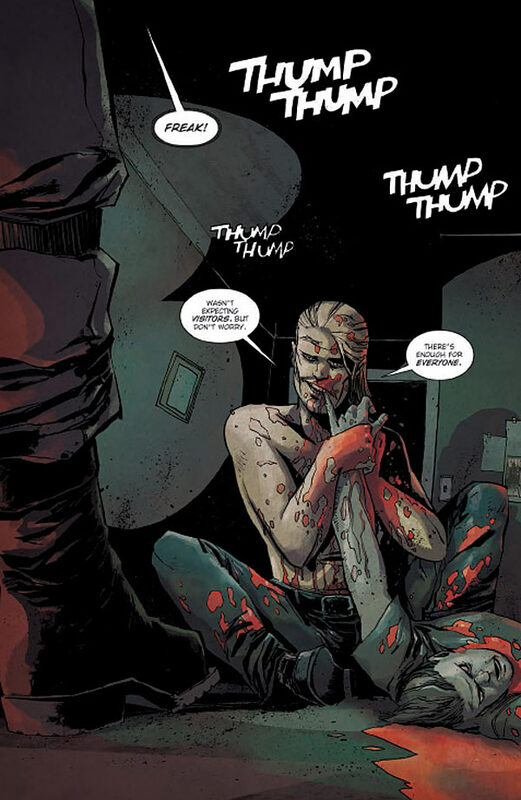 As the titular character, he does not disappoint with his intriguing ways, and for fans of Scott Snyder’s American Vampire, you’d be reminded of Skinner Sweet in more ways than one. Another plus point that makes the series so irresistible is the way in which the minor characters, and even the one-offs, have been handled so well. From Alice, the troubled teenager hiding her own secrets to the deranged pregnant woman who wants to give birth to her child in Buckaroo so that he can grow up to be a serial killer, these protagonists are not just fillers to kill time while the heroes go off to nail down the bad guys. They have a whole set of back-stories that make you wonder about the richness of their narratives as they are teased out, especially as they lend so much depth and intrigue to the infamous legend of Buckaroo, and build on its notoriety. And of course, the shadow of 16 (sixteen!) 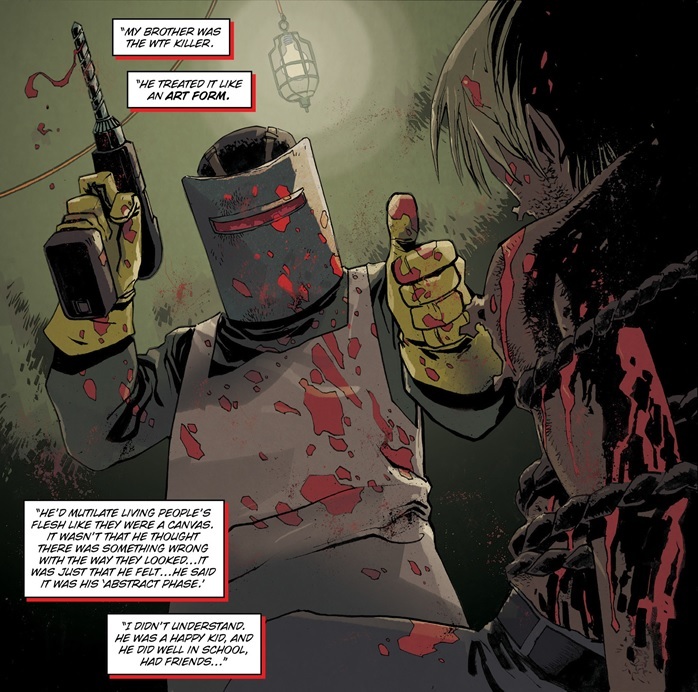 serial killers is an ever-present shroud, competing with the main plot of Finch and Crane getting down to bottom of the town’s gruesome mystery. Owing to the nature of the medium, rendering horror in comics is no mean task, especially as the chills and thrills are lost. 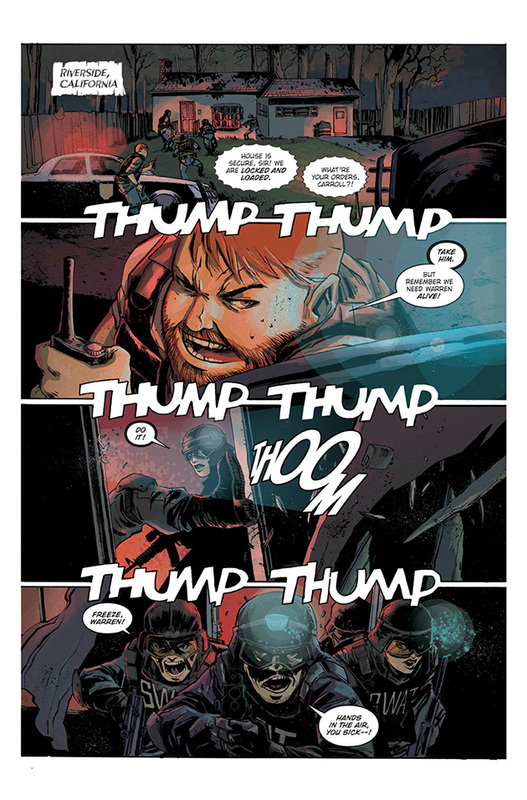 Nailbiter, however, is not your run-of-the-mill comic, and it’s a true joy to see a horror comic deriving its tension from beyond mere gore and guts. Personally, I can’t wait for Williamson and Henderson to come up with issues as quickly as they can and reveal Buckaroo’s nasty secrets. Sabitha works in advertising, and has loved comics since she encountered Death of the Endless on a long, tiring night. She only hopes that when she finally encounters Death, She is all she imagined her to be.